First for Grilled Chicken, season the chicken breast with salt, pepper, mixed herbs and rosemary. Coat it nicely. Now heat oil in the pan and sear the chicken from both sides to get some color. Then cook it for 4-5 minutes on each side on medium. Then cook it in oven for 15 minutes on 200 degrees C. Let it rest for 10 minutes and then slice in the sizes of your choice. Now take a bowl. Add all veggies and chicken. Add some lime juice and salt and pepper. Don't add to much as we will add some in our dressing. For dressing, take a small jar with lid. Take the smallest you can take which can hold the vinegar and lime juice in mentioned quantities. Add some salt and pepper to it. Now close the lid and shake it hard for 2 minutes. Your dressing is ready. Now pour this dressing over salad along with some mayonnaise. 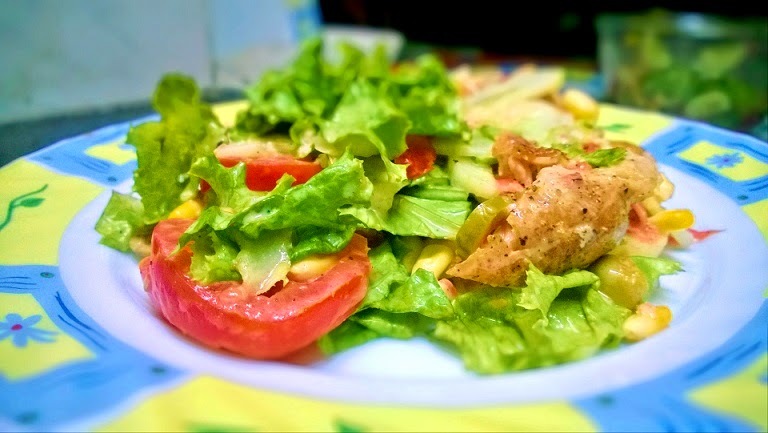 Now here it is, your super healthy chicken salad. Do leave your comments below and subscribe to my blog via Email to receive new recipes.